If you are a member of the Churches of Christ, and attending any of our lectureships during the year, let me introduce the One Voice for Change movement. Over the last few years the Churches of Christ have made great progress in moving toward gender justice and equity. And yet, more progress can be made. Given that the Churches of Christ have a free church structure, with each local church governing itself, the bible lectureships hosted by our universities are important places to have critical cross-congregation dialogue, advocate for change, and shape our collective imaginations. And lectures such as the Pepperdine Lectures and the ACU lectures have made great strides in including the voices of women. To date, however, women have not been invited to give a Keynote sermon at our lectureships. One Voice for Change is a movement seeking to change that, a year long effort to request that women be invited to participate in the Keynote sermons at our lectureships. Thus, this year, 2013, will be a year of conversation, advocacy and prayer. If you are attending the Pepperdine Lectures next week look those wearing a One Voice for Change button to jump start conversation and networking. And wear a button yourself if you find a friend handing them out so that you can show support and catalyze conversation. And beyond that show of support, engage in prayerful conversation with members of your local congregation, expressing your desire to see a woman Keynote at our lectures, and also for women to preach in your own local congregation. And you can Tweet out or Facebook a link to One Voice for Change. Feel free to use whatever social media you have to say you would be supportive of woman delivering Keynotes at our lectureships. You can follow One Voice for Change on Twitter. "In the last days, God says, I will pour out my Spirit on all people. Your sons and daughters will prophesy..."
After next week One Voice for Change be looking for prayer and conversation at the upcoming lectures at Abilene Christian University in September. If you aren't attending a lectureship this year you can start following the One Voice for Change website to participate in other forms of advocacy. I'll try to keep you updated as well. And a final important note about advocacy efforts and your prayers. First, remember that our lectureship directors do not have the power to make these invitations. Invitations are in the hands of university leadership and Boards of Trustees. That said, the most important form of advocacy is with your local congregation. For two reasons. First, while universities can lead they also follow and respond to their congregational constituencies. So work at the local level is crucial. Second, and more importantly, the broader vision isn't for our lectureships but for gender equity in the church. May the Kingdom come, on earth as it is in heaven. Andy Benton's father died last night in Oklahoma. Please don't attempt to speak to him about this next week when he returns. That's sad news. I've added a note to the post. I should point out one corrective to this -- The Streaming Conference at Rochester College has made it a priority to feature women preachers. Katy Hayes preached the final sermon at the first conference and Sarah Barton at last year's. And the opening sermon will be Kim Seidman. Now, all three have Church of Christ backgrounds, but only Sarah remains within the communion. But I thought it useful to lift up RC, even though I am a Disciple! But Pepperdine should take up the challenge from Rochester! Show some respect for Katie Hays and Sara Barton by spelling their names correctly. I'm sure no disrespect was intended. I especially echo the work on the local levels. As a theologically trained woman in Churches of Christ (DMin in progress), one of the things I most grieve is the lack of opportunities for young women as they are growing up and then as they prepare for ministry. It has caused me to look at the ways I "do" ministry and opportunities I extend to others. For many of my female college students over the last decade, college was the first time they had the opportunity to pray out loud, read scripture in font of others, or lead a small group or devo. Local churches must be intentional to provide these first steps in preparation as well. When male minister colleagues speak of large future goals for gender inclusion (which I support) I ask them how they are working toward that on the small level in their local setting. When I think of the Civil Rights movement I'm reminded that a lot of attention was and is focused on MLK and the big speeches. But really, it was the small and local acts of courage that made the real difference. In some ways, it is also the harder and longer work - bringing change (of any sort) into our local context, into the places we live and where we are vulnerable and accountable. Yes, the big moments are important to the movement, but it is not where we dwell daily. Several recent articles have demonstrated President Benton's resilience and ability to govern well during times of family crises to his great and enduring credit. If he is on the job at the Lectures, he surely would be willing and able to engage in constructive discussions about gender justice at the heart of the gospel. Male ministers in urban areas will find it much easier to work toward gender inclusion than those who find themselves in small town and rural congregations. Not all new preachers are blessed with ready-made progressive congregations. Rural ministry is very difficult, the culture lets the minister know up front that he is there to comfort, not to change things. I am sure most who are reading this are aware of that problem. I am simply stating that support and resources must be made available to the rural minister. Feeling cut off from others like-minded has a way of "waiting for a more opportune time". I certainly recognize that there are distinct differences between urban and rural area churches, but I think it is possible both places- albeit to different degrees and to different costs to the minister. Ministers that commit to live out their ministry in these setting have my utmost respect - it can be a lonely place on so many levels. 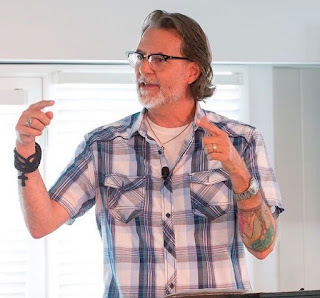 Early on as a campus minister, I worked for a small church in Kansas which was certainly not going to be open to things that are possible at my current congregation (Highland in Abilene). They were however, open to me joining them to primarily work with the female college students. We were able to provide opportunities for female students to lead prayers, groups, etc. - often with other women - never on Sunday, once on a Wednesday. This at least let women use their giftedness outside of the kitchen and the nursery. (I have great appreciation for those whom their ministry is hospitality and/or providing for the small children of the church and think it is an important way to serve and minister. I also think that there are many men that are gifted in these areas and sometimes our current gender roles inhibit them from serving in these roles too.) It allowed these young women to practice these disciplines and skills and think critically about their faith and the ways it is lived out and articulated. It also taught them that they too are valuable members of the community. There were certain spaces that were (and most likely always be) off limits, but in the other spaces - we found more room to be creative. Please hear me say that I recognize the challenges that these small rural churches face are great, but I also believe they have potential in this area too, even if it looks different. One blessing I experienced in this Kansas church was the way the community loved each other more than in any other congregation I had been a part of before or after. That's amazing. I really think that we've limited what we can learn theologically from women, because we don't let them to speak in our conferences. It's kind of one of those self sustaining systems. Because women aren't allowed to "teach theology" in the CoC, women don't get bible degrees, which means their aren't female teachers to teach theology. And because their aren't female teachers, well there aren't mentors to draw others into the field. In the end we all lose because we miss out on what women can teach us about being the image of God. Very informative and well said.. I am an egalitarian and have served with a church for the last year and a half that isn't egalitarian but is more gender-inclusive than most Churches of Christ, blessing those women who a gifted to lead in worship, teach the adult Bible class, and lead various ministries. The church made this change about ten years ago and at the time it was a growing suburban church of about 125-150 members. Today this church is about 40 members and without a renewed commitment to God's mission (which we are pursuing), it will continue in decline until it no longer exists. While there are several reasons for decline of membership, a big loss came when the church split over the gender inclusive decisions made by the church leaders at the time. It was a fifteen year-old growing and evangelistic church then and now... So while I hold an egalitarian view in regards to gender and the Christian faith, I wonder if the decision the church made then towards a more gender inclusiveness was worth the price it has paid...and worth the life of the church should it die out in a few years? I ask this question not to dampen the desire for gender inclusiveness in the Churches of Christ, but to caution us to make sure that any changes pursued and/or encouraged don't come at the expense of God's mission. It would be a shame to win a battle but lose the war, if you know what I mean. I think that is an important story to share. I don't have any great answers. How one answers, I expect, depends upon if one approaches the issue more pragmatically or idealistically. And depending upon where one falls on that spectrum you can have egalitarians pitted against each other as to the best course of action. Dr. Beck, do you happen to know whether the One Voice folks will have any visible presence at ACU Summit this year (buttons, etc.)? I'm not in the leadership role, just a friend of the movement. But in my talks with them they are planning to come to ACU's Summit. Let me add this. People have to do what they think is right. And that might mean playing the long game, tilling the soil and preparing the next generation where a harvest will be reaped. Others will see this as a bright moral line in the sand, a tangible form of injustice and that Jesus's call isn't to "effectiveness" or "growth" but to death in suffering for others. And all that just describes the conflict between the people who agree with each other. Let alone the people who disagree. The point being, we just have to trust that God will work through it all. Do what you think is right, but extend mercy. As I told a person involved with One Voice for Change, when it is all said and done we are all, no matter where we end up on the issue, going to have to forgive each other, over and over and over. Forgiving seventy-times-seven. No one gets out of this without some damage to relationships. Even if you try to do nothing, as doing nothing creates conflict with those who want to so something. We will hurt each other. No escaping that. And the only answer for that eventuality is mercy. Something like that was the initial plan. But before going to that point the organizers felt that a season of simply asking for inclusion is the best first step. Ask, petition, talk first. Then, if asking doesn't work, you contemplate some sort of action, and maybe that action is just keeping up with the asking. Great point—putting that kind of leveraging pressure may be unnecessary at this point (or may never become necessary) if conversations seem to be fruitful to any degree. Brent, as another friend of the movement, I think it would be safe to say there will be buttons at ACU. Thank you for your generous response which is a way of practicing mercy. And your remark about showing mercy is so needed and on both sides of the aisle. I should add that I served in another church where some changes were made towards more gender-inclusion and the changes went over with little division, members leaving, etc... So making changes like this are possible. Of course, only the local leaders can know best when is the right time to make those changes and how they go about is extremely important. Good listening to the members and open communication with the members on the part of the leaders cannot be stressed enough. Excellent...Thanks, Jen! I'm not sure what else they're planning to do to have a visible presence at Pepperdine and ACU, but I'm glad to know the movement has momentum. Rex, I know that some would see a church declining as an all or nothing issue...as in they are declining so maybe this wasn't the right choice for this church at this time but would you say that now if the issue were racial inclusion or economic inclusion? I just think that it is all the same...we are all the same and anytime we are excluding anyone we are wrong and it needs to be fixed and sometimes at the expense of the organization. I want to partially disagree here. There are a lot more women in the CsofC who are theologically, biblically and pastorally trained than we think--one of the most visible points of crisis, in fact, is the number of female MDivvers who graduate into an ecclesial void. So a great many leave, because the church forces them to follow their call elsewhere. And the church doesn't notice, because (and this is where I agree with your description), we didn't welcome their presence, gifts, voices, calling in the first place. How do you notice the absence of or miss the voices of those who are silenced? But we're here. And we are trained, and gifted, and ready to serve. I'm very proud of my CoC roots and even prouder at the changes it is trying to make. How should we make a stand for this locally? How should we call our brothers and sisters to this teaching in a way that is not accusatory or spiteful but gentle and loving and sincere? These are things I will pray but I would love your thoughts. Like many growing up in the CoC this issue was not discussed. However, since attending grad school and doing inner-city missions for nearly 9 years now I've come to really question the fruitfulness of this debate. It seems (please correct if wrong) the center of the debate is that the church does not treat women equally with men because they are not permitted or required to engage in formal acts of worship or leadership. My earnest question would be, what impact does this practice have on women fulfilling the two primary commandments, (Matthew 22:37-40) love God, love neighbor? In my experience and study this issue seems comparable to the issue of spiritual gifts in Corinth. Men have abused their stations and risen the importance of these "male only" positions and jobs so that then they are in a position to oppress women. Clearly this is not biblical. Just as the Corinthians were taking spiritual gifts and placing a pecking order with in the church. Paul corrects this by placing the true value of spiritual gifts in love. I've been blessed to be apart of several fruitful outreach ministries where this is a non-issue. I believe the reason behind that is because we don't focus on who is allowed and not allowed to fill these speaking roles. I've had many women team mates (who hopefully I've not oppressed or treated unequal) who have freely practiced (and effective) love God and love neighbor without having to be the preacher or formal speaker. I believe the church has placed an overly heavy influence on the Sunday morning service and "official" class time. The actual value of our community walk, I believe is found in how we love others. Let's talk more about that and encourage all genders to pursue that instead of argue and split over this. 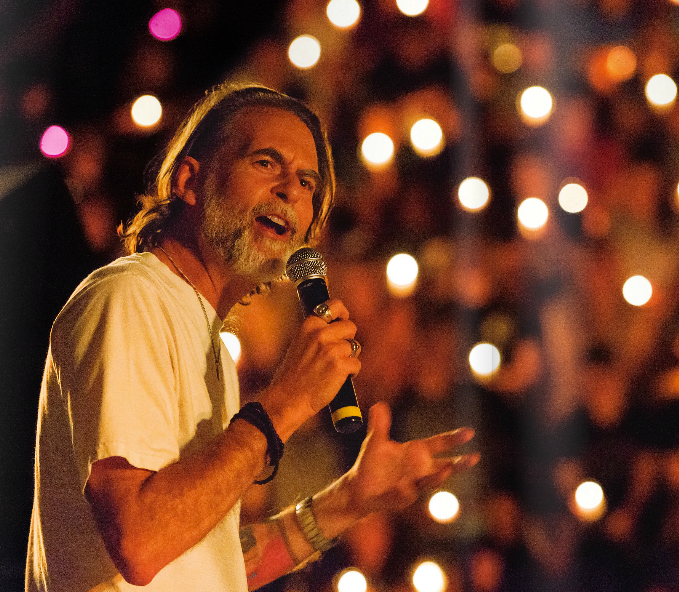 "[Note from Mike Cope, Pepperdine's Lectureship Director: Andy Benton's father passed away last night, and he requests an increased measure of sensitivity for Andy next week. Condolences to the Benton family.]" What in the world was anyone planning, that Mike had to go out of his way to request this??? I don't think anyone was planning too much more than what is going on this week. It's been quite peaceful, conversations and buttons and lots of good links and tweets on Twitter and blog posts, from what I have heard. Could his request have been more fear based than necessary? Where can one get a button if one isn't able to attend these types of lectureships/conferences? 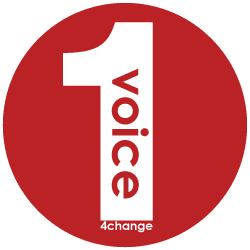 At the One Voice for Change website there is a message link (top left corner) where you can submit inquiries. I'd start there. It seems to me a lot of people are departing from the word of GOD. Have you forgotten I Cor.14:34 , 35 which says "Let your women keep silence in the churches: for it is not permitted unto them to speak; but they are commanded to be under obedience, as also saith the law. And if they shall learn anything, let them ask their husbands at home: for it is a shame for women to speak in the church." I Tim.2:11,12 "Let the women learn in silence with all subjection. But I suffer not a woman to teach, nor usurp authority over the man, but to be in silence." Read also Titus 2:3-5. Here it specifically gives a woman's duty. Read also I Peter 3:1-6. Women do not have to be in the "spotlight" in order to serve GOD properly as the scriptures teaches. We are not to usurp authority over the man. GOD has set this system of authority in place. GOD, CHRIST, man, woman and children. We need to keep this pattern in order to be pleasing and faithful to GOD.